Let's talk game engines. For a current project, I'm writing a game engine completely from scratch. Before I started I wrote down some key functionalities the engine should be able to handle. After writing that down, the proces of creating the engine boils down to optimizing the functionality in terms of performance and memory requirements. Before we dive into engine compositions, let's look at two big AAA game engines used to create games which are used by a large number of developers today. Unreal Engine 4 is mostly known because of the impressive graphics that can be created within a few mouseclicks. The engine is open source, and is an all-round engine that supports nearly everything you can think of when creating a game. 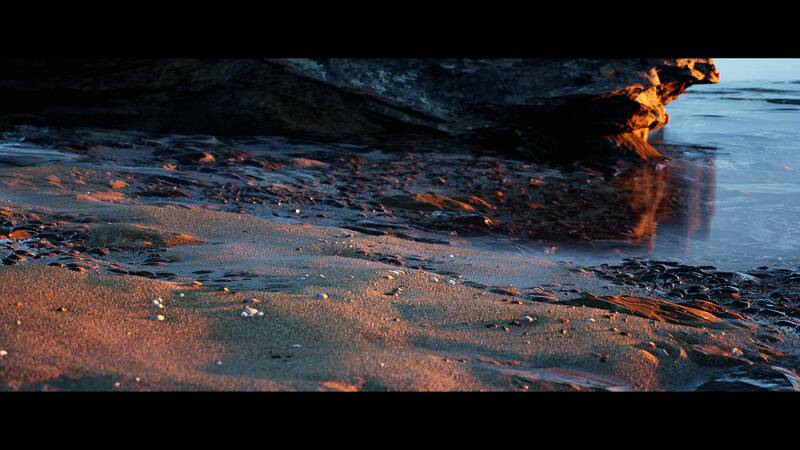 Below you will find some amazing pictures rendered using Unreal Engine 4. Unity is an all-round game engine designed to ease the development process by working with C# as its core language. Unity is a lot more oriented towards an entity component system than Unreal Engine 4. These engines took years to develop, and can practically support any use case. For my engine I'm looking to only support a very narrow subset of these use cases. The thing both engines have in common is that they are both entity component systems, which is what the remainder of this post is all about. Mainly, there are two compositions for game engines. The first one is Object Oriented Programming (OOP), and the second type is an Entity Component System (ECS). There are already a lot of resources available to learn about both. I compiled a small list of examples, and will revisit the topic briefly. Shows a clear and concise introduction to OOP vs ECS systems. The main reason to use OOP for games, was that the concept is easy to grasp. You create a hierarchy for all objects, and code reuse is introduced by polymorphism. In the diagram below you can see an example of OOP used in a game engine. It's clear to see that the EvilTree can't fit in the hierarchy, because it would require inheritance from both static and dynamic entities. While this is possible in some languages, it can lead to difficulties known as the diamond problem. Where you can see that all the objects are derived from different components. The components can be reused for any object, this makes it easy to add new entities. Now that we are up to speed with game engine compositions, let's look at the path forward. This paradigm is the design principle behind the ECS system. The basic principle is instead of looking at code, look at data. This concept is derived from the fact that most applications are memory bound instead of processing power. 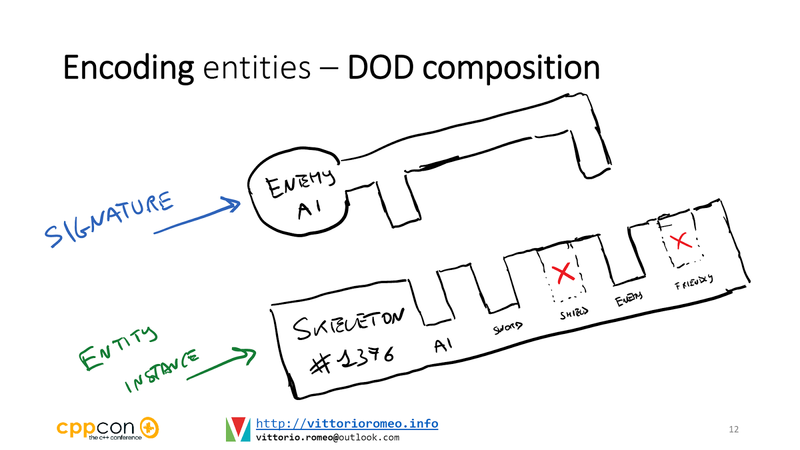 The main point for DOD in game engines focusses on using the ECS in a way that avoids cache misses. To illustrate this, we look at the table below. In this ECS from , we can see on the left all the entities in the game, and in the table all of the components they exist of. When viewed from a higher scale, the only thing we changed is instead of looking at the diagram from left to right, we now look at it from top to bottom. So in our code we define our components as a list of Position components, Movement components, and so on. For every entity we add, we simply add one of each component to all component arrays. This is why there are holes in the diagram. All the way at the top of this article, I said that the engine is a balance between performance and memory. We can now clearly see why this is the case: this layout consumes a lot of memory to increase the performance. The "Script only" object creates 5 empty components which will never be used. We can define three points to weigh all our engine needs. Now we have to define how to determine the efficiency of all of these points. Measuring cache efficiency is tricky at best, and this is very dependent on optimization. So instead of a ratio, we define the following: An engine becomes more efficient if we require fewer arrays available at the same time, and the smaller the size of a single item in the array the better. The ratio for memory efficiency is defined as the total used components divided by the total created components. We can determine the parallel efficiency by looking at the percentage of work that can be executed in parallel. For a complete calculation of the speedup, we can look at Amdahl's law. We can see that this would lead to a good cache efficiency, but not the best: A physics component can't operate without a position component, this means we need multiple arrays simultaneously when updating entities. But the big advantage here is that all the arrays are separated, and can be queried individually per component. The memory efficiency is bad. The ratio for this particular example is already 19/30 = 63%. That means that 37% of our memory is just thrown away for the sake of efficiency. The parallel efficiency leads to a tricky scenario: how can you execute ECS in parallel? In this particular case, we pretty much can't. The physics system updates the position component, and only after that, we can render the component using the new position. In order to process everything in parallel, we'd have to look from left to right (per object) again, and processing the objects in parallel would require ALL data available in caches, which in turn would lead to a lot of cache misses.. In conclusion, we can say that we traded off space for time. We require more memory, but less processing time due to cache efficiency to process all our objects. In this case, the signature tells us that we require AI and Enemy components. In the implementation, we have systems that update all entities containing specific signatures. To create a simple parallel processing ECS, we can simply say that every set of systems that don't have any component in common can execute at the same time. In our example, with a physics system and rendering system, this would not work, since they both rely on a position component. While this could be the solution, I very much disliked the amount of work required to implement this, and keep up with all the overhead of adding and removing components. In my engine I opted for an ideal solution, within the constraints of C++ (static types, known at compile time). With the power of C++ 11, we can reach a lot using variadic templates, and I built a lot of my implementation with it. I based my system on the implementation of . I use signatures to define a set of components, and I also define systems by providing a signature. But instead of storing components separately in one array per component type, I took a step back in 'engine progression'. I define one array for every possible signature. If you read that carefully, you should already be thinking, that would require a lot of arrays! If we define up to 64 different components, and generate one array for every possible signature, we would have 1.8446744073e+19 arrays. Possibly requiring more memory than the complete application that we're building. So instead of creating one array for all possible signatures, let's create one array for every signature used. The tricky part is finding all possible signatures at compile time. And we can't do that in C++, since we have no such library as reflection from C#, where we could query all that. We will use C# to create our signatures before the C++ compile time, so we know all the types at compile time. For this we will use something commonly used in web development: text templates. If it's your first time working with these in visual studio, I recommend the syntax highlight plugin. Where I define a function "GetComponents()" in a DLL CodeGeneratorFunctions, to search all our files for component signatures. I was pleasantly surprised with the runtime, as I thought it would take years to search all those files, but it actually took less than a couple of seconds. Similar to this example, I wrote text templates for all signatures and systems. Back to engine talk, now that we have our component composition, let's determine how efficient this engine could be in theory. Cache efficiency. At first glance, the cache efficiency would suffer in comparison with the original ECS from , but it's hard to tell. We have a larger single item size in the array, but we only require one array simultaneously. Below I explain a small optimization that reduces the individual item size. Our memory efficiency is great. 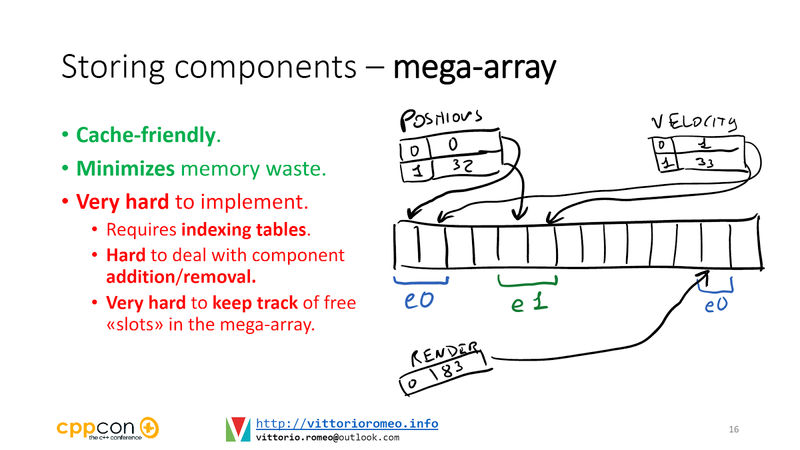 Since we can basically store only the necessary components for every object, we waste 0% of memory, with a little overhead of creating a lot of arrays in larger systems. The parallel efficiency is similar to the ordinary ECS. We can only execute systems in parallel when they contain unique component sets. So in theory, we got an advantage in terms of memory. But we are still questioning if the cache efficiency changed. Looking back at the mega-array structure, we can see that we improved a little, we can store our velocity and position together in one array, so we don't have to acces two separate arrays and have cache misses. The main disadvantage of this structure is when you use larger objects. If we have an object storing a lot of components, the item size of the array is going to be large. And a large item size means cache misses. We can make our engine more cache friendly by using hot/cold data separation. As example, we consider objects storing data for physics (position, velocity) and rendering (huge models of 300MB). Loading only two of these objects, is a guaranteed cache miss, since the two objects are 300MB apart in the memory lane. The solution is to store a reference to the model, rather than storing it completely, and only call the model when it's required for rendering. This way we can update the physics without cache misses (a pointer is only 8 bytes). The hot/cold data separation separates hot data (used multiple times) versus cold data (used sparsely). If you want to read more, I suggest reading the article on gameprogrammingpatterns about this topic. To improve up on the parallel execution of the system, we can schedule all the work of one system in parallel. Since one system will be handling multiple arrays of objects, the first option is to execute all of these in parallel, and the second option is to execute all of the items in one array in parallel. Since the arrays have different lengths, the first option would be a bad choice (one thread would take very long, while the others would be waiting). Thus linearly processing all arrays, and execute all items inside that array is the best option. Further optimizations can be done by using SIMD instructions, but that is outside the scope for this article. I'd like to see if I can increase parallel efficiency by introducing tech from Naughty Dog's engine. They have a great presentation about it available online. Instead of introducing parallel execution per system, I'd like to see if we can create a set of instructions per signature and create a fiber to execute that. When I'm done creating the engine (which is never, because it's a game engine) I will compile some benchmarks compared to a 'normal' ECS implementation. I also hope to release some source code from this engine. hallo Robbin, i programmed a little ide in c++ under win32 (for now) that supports this entity component system, but currently i'm stuck on compiling the generic entity cpp script because i cannot link correctly the script dll that should be later loaded in the runtime environment.the outputted dll is too big cause it comprise the entire app code. how can i link the dll without export all? Hey, have you checked the MSDN articles on linking DLL's? https://msdn.microsoft.com/library/d14wsce5.aspx for example. Otherwise I suggest you search Stackoverflow for the specific problem you are having. I'm happy to help with more specific questions about the topic. Really lovely image of a Binary Key - when I presented DOD/ECS during my bachelor degree, nobody seemed to understand the concept of a simple binary key / bitmask, or how it could relate to some vector of arbitrary systems.